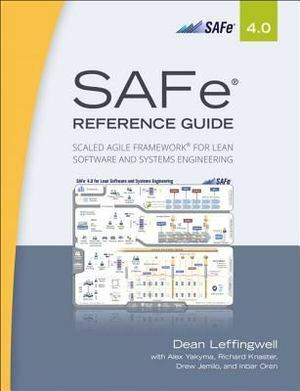 The Must-have Reference Guide for SAFe#65533; Practitioners "There are a lot of methods of scale out there, but the Scaled Agile Framework is the one lighting up the world." -Steve Elliot, Founder/CEO AgileCraft "You don't have to be perfect to start SAFe because you learn as you go-learning is built in. Before SAFe, I would not know how to help my teams but now I have many tools to enable the teams. My job is really fun and the bottom line is I have never enjoyed my job more!" -Product Manager, Fortune 500 Enterprise Captured for the first time in print, the SAFe body of knowledge is now available as a handy desktop reference to help you accomplish your mission of building better software and systems. Inside, you'll find complete coverage of what has, until now, only been available online at scaledagileframework.com. The SAFe knowledge base was developed from real-world field experience and provides proven success patterns for implementing Lean-Agile software and systems development at enterprise scale. This book provides comprehensive guidance for work at the enterprise Portfolio, Value Stream, Program, and Team levels, including the various roles, activities, and artifacts that constitute the Framework, along with the foundational elements of values, mindset, principles, and practices. Education & Training Key to Success The practice of SAFe is spreading rapidly throughout the world. The majority of Fortune 100 U.S. companies have certified SAFe practitioners and consultants, as do an increasing percentage of the Global 1000 enterprises. Case study results-visit scaledagileframework.com/case-studies-typically include: 20--50% increase in productivity 50%+ increases in quality 30--75% faster time to market Measurable increases in employee engagement and job satisfaction With results like these, the demand from enterprises seeking SAFe expertise is accelerating at a dramatic rate. Successful implementations may vary in context, but share a common attribute: a workforce well trained and educated in SAFe practices. This book-along with authorized training and certification-will help you understand how to maximize the value of your role within a SAFe organization. The result is greater alignment, visibility, improved performance throughout the enterprise, and ultimately better outcomes for the business.